You are here: Home / Tile / My vanity is stained and scratched, should I replace it? My vanity is stained and scratched, should I replace it? Before and after bathroom vanity tile refinishing from Miracle Method. If your bathroom vanity has seen some wear and tear over the years, there is no need to replace it. Unsightly scratches and stains on your vanity and bathroom sink can all be repaired through the process of refinishing. 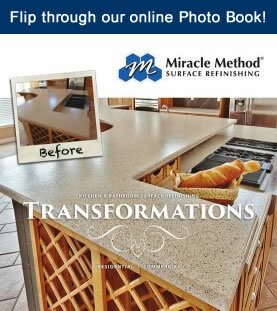 When you choose Miracle Method to refinish your vanity, you will actually save about 50 percent or more over the mess of removal and replacement. Furthermore, the more unique and intricate your bathroom vanity is, the harder and more costly it will be to replace it. When making your decision, remember to factor in all of the extra costs such as plumbing, and replacing mirrors and painting and/or replacing wall treatments. If you have tile, cultured marble or Formica® countertops on your vanity, refinishing is often the best option. Refinishing can extend the life of your vanity and sink for 15 years or longer. When it comes to colors, most homeowners are chosing Miracle Method’s new Natural Accents™ which are available in over 30 designer colors. The overnight transformation is incredible! To find a Miracle Method location closest to you, call 855-212-7337.